Funny how we all keep showing up back here. I know it’s a bright spot in my day! I hope it is in yours too. On Monday I shared pictures of our backyard and the $16 bright orange accessory that’s rocking my summer! Who knew I would love the color orange so much? Then (imagine me throwing confetti here) on Wednesday I told you how I finally completed a project! I managed to not lose two tiny keys during an international move and I found a place to hang them. One project down. 5 million more to go. Totally doable. Totally. Also, big thanks to Handy Husband for rescuing my website from trouble over and over again this week. He’s a keeper! Here’s this week’s Happy List! 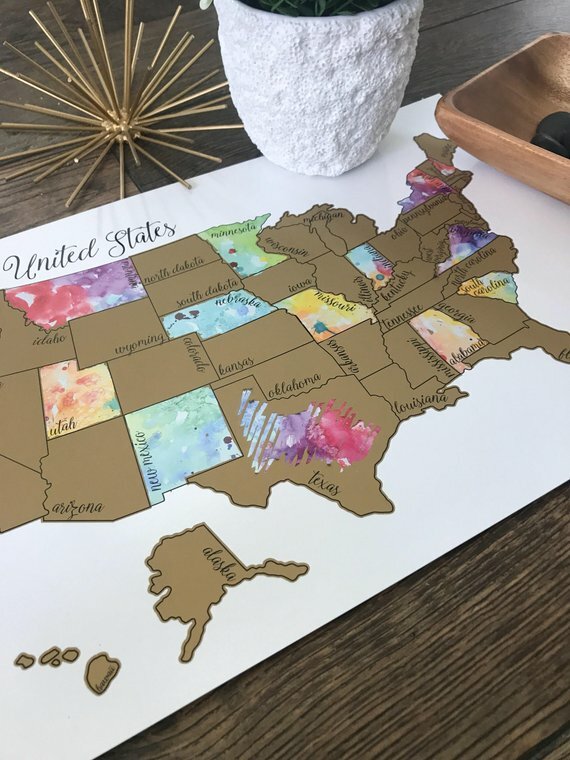 I’m dying over this scratch-off watercolor map! Such a neat idea! If you have a colorful home or kid’s room, you need this map! It would be a great gift and it’s only about $30. It’s by an Etsy shop called Kristin Douglas Art and she also has a world map version! Oh boy oh boy oh boy. 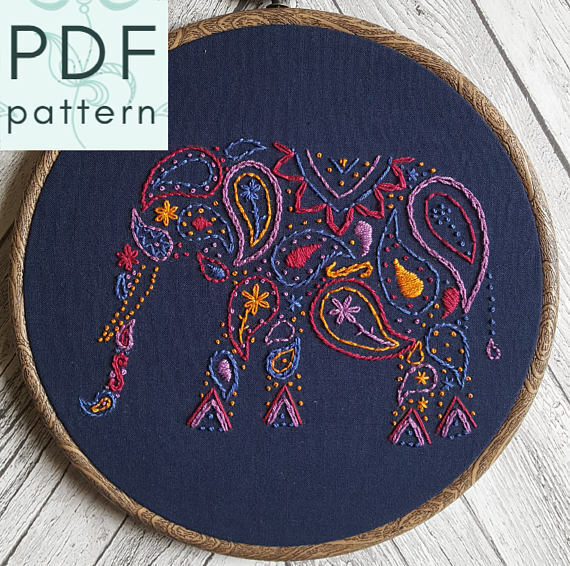 On a scale of ‘Annisa, you could totally do this’ to ‘Keep dreaming, sweetie’ where do you think this elephant embroidery pattern comes in? If I started now I could finish a project like this in about 5 years, right? Also, patterns embroidered on navy fabric are my new favorite thing. Everyone and their sister probably saw this picture of Joanna Gaines’ nursery a few days ago. I’m not showing you anything new here. But can we take a moment of appreciation for that vintage frame with rounded edges? That’s really cool. It’s science time at our house! 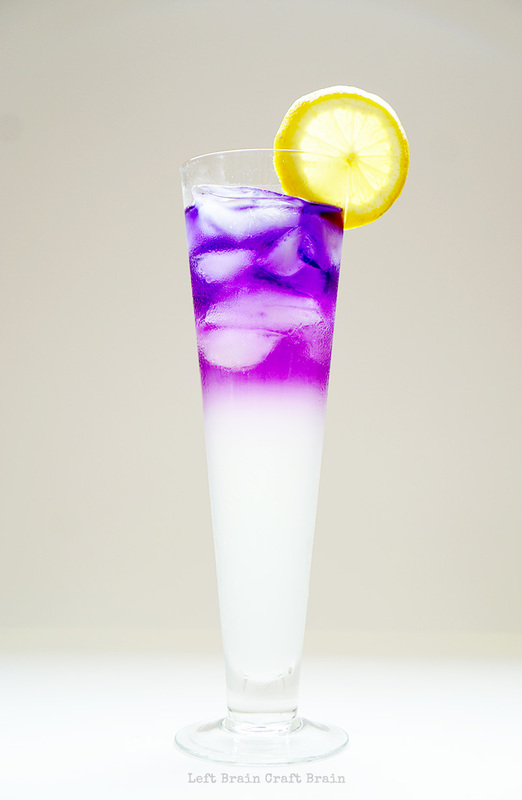 Yesterday the Butterfly Pea Flower Tea arrived from Amazon and the kids and I are going to trying to make this color changing lemonade! The tea, which I’d never heard of before, is the secret ingredient for the color changing science. Directions can be found at Left Brain Craft Brain. Wish of luck! And bottoms up! Me: Do you have butterfly pea flower tea? Me: Not pee, but pea like peas. That you eat. Not like pee. Her: Ma’am, I know what you mean. Me: Oh, good! Glad I cleared that up. Geez. That wasn’t awkward or anything. I was kind of glad when she came back on the line 5 minutes later to tell me they didn’t carry that particular type of tea. 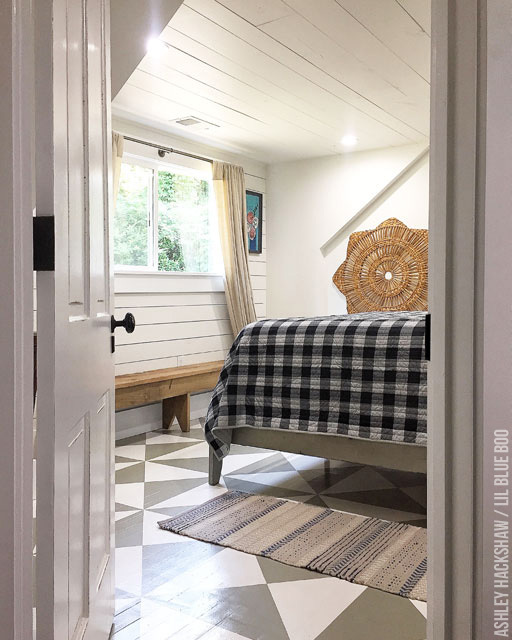 My hat is off to Ashley from Lil Blue Boo for this painted floor. You have to see how she taped it all off. This project had to have taken a lot of patience and attention-to-detail. But, man! The result! In other news, I probably won’t be attempting to paint a quilt on my floor anytime soon. This is the brightest, happiest sideboard/dresser I’ve ever seen. If colorful furniture and amazing painting techniques are your thing, definitely check out this Instagram account. 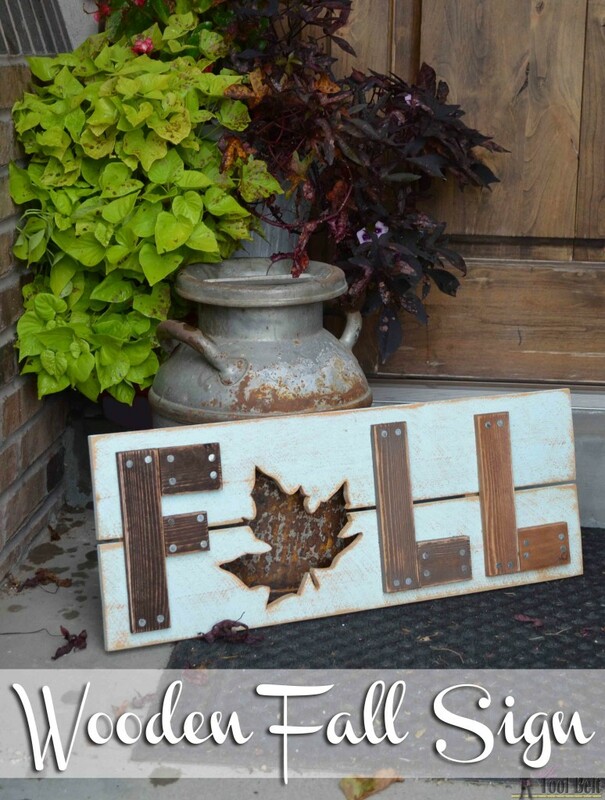 This farmhouse-style fall sign would be easy to recreate by using a metal leaf from the craft store. You could even stencil a leaf on the sign instead of using a router to cut the leaf shape out. All the directions are in an amazing tutorial by Her Tool Belt. I was looking for a metal leaf for you and then stumbled upon leaf-shaped doorstoppers . Anyone else get distracted while online shopping? I’m eating a lot of peaches lately. 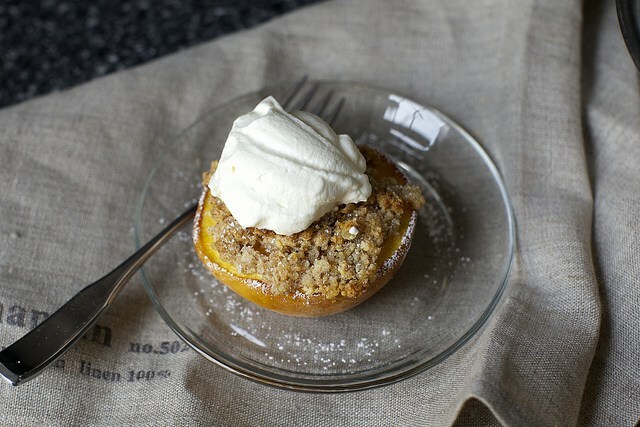 Topping peaches with a crispy almond crust sounds easy and delicious enough to try. Hope you have some tasty peaches this weekend! Happy Friday!